Pick and Chew this Biscuit Day with NetFlorist! In honour of Biscuit Day on the 29th of May, we are showing off our mouth-watering assortment of delicious biscuit and cookie gifts from the premium NetFlorist bakery. So, for anyone who is raisin’ the bar, we’re hoping to bake your day and theirs a little sweeter. Take a look at our selection and let us know which is your favourite! Spoil a someone with a sweet tooth with the perfect tea-time treat and send them these yummy biscuits! This Cookie Crunch Delight box comes filled with four flavours: vanilla and carrot cake, choc chip birthday cake, caramel and apple crumble, and coconut and rose. It’s the perfect gift to send for Biscuit Day or any other occasion! All our products are Halaal, too. 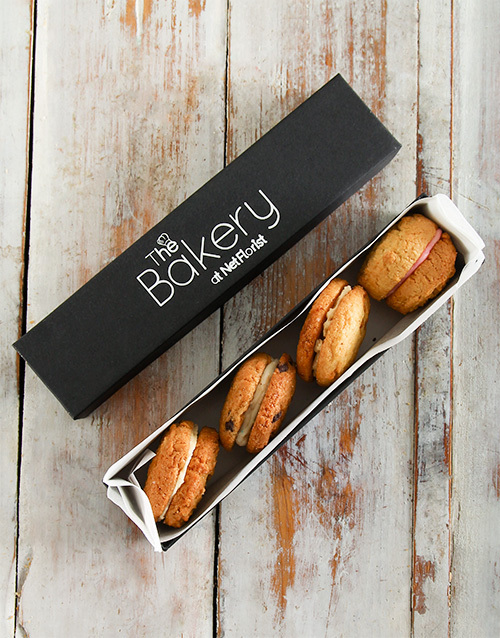 Choose to send four cookie sandwiches for R99.95, or upsize it and send eight for R199.95. Get this personalised sugar cookie gift for Biscuit Day and make their day as sweet as can be! 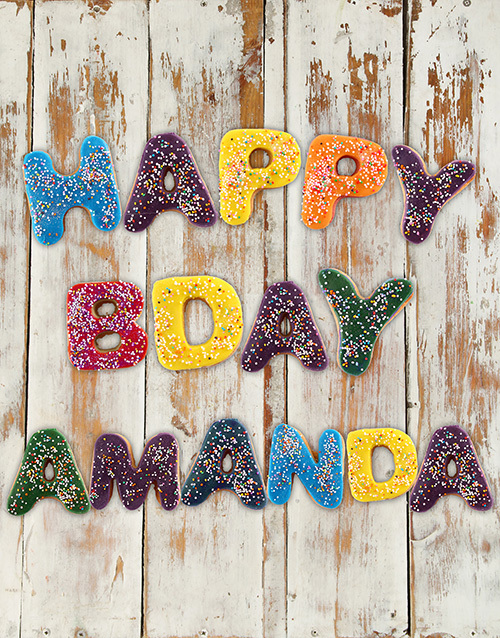 Choose a message of your choice consisting of 16 letters and say it with sugar cookies from R199.95. Enjoying a cup of tea or coffee with a biscuit is perfect at any time of the day! If you know someone who is a bit of cookie monster, then send them this scrumptious gift to celebrate Biscuit Day. 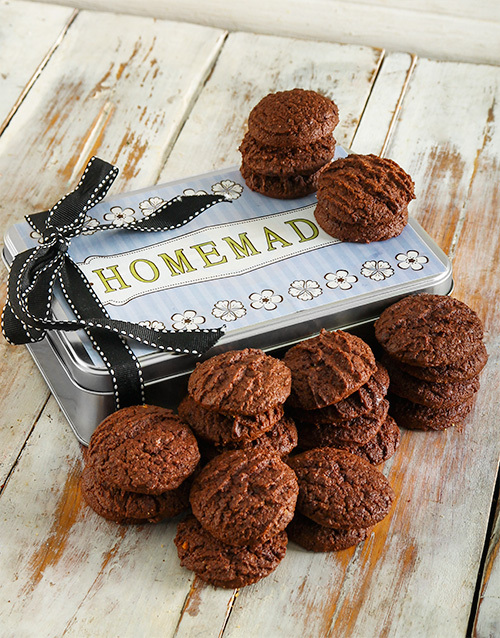 A keepsake cookie tin comes filled with 24 crunchy double chocolate cookies for R229.95! 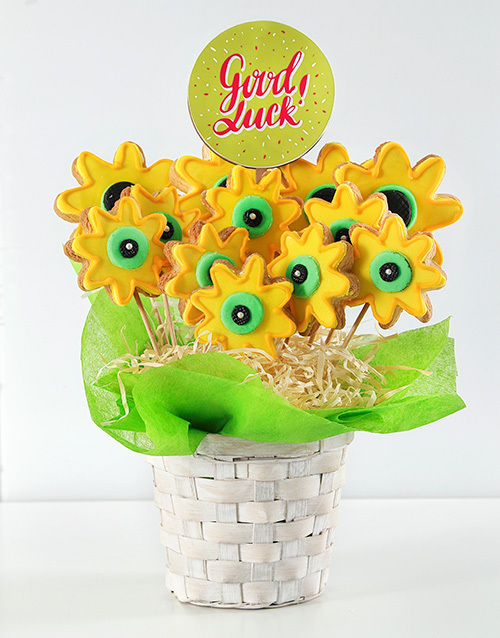 Make Biscuit Day a sunny day, no matter the weather, with this adorable bright yellow Sunflower Cookie Bouquet! Made up of 12 vanilla cookies, they’re decorated with fondant and royal icing and placed in a white woven basket. This lovely, tasty bouquet will put a smile on anyone’s face, no matter what the occasion is!